The College values academic achievement and student service. It fosters these values by providing students with opportunities to join honor societies that acknowledge students whose academic accomplishments and/or service have been exemplary and who meet the criteria for membership established by these national and local organizations. Honor Societies at Ramapo College are chapters of national organizations that recognize and promote excellence in academic and extracurricular areas. Honor societies are selective organizations. Eligibility for membership is based on criteria established by the national organizations. Induction ceremonies are held annually for each honor society. Students who are interested in joining an honor society should contact the faculty or staff advisor for the honor societies for information about the application process and membership criteria. 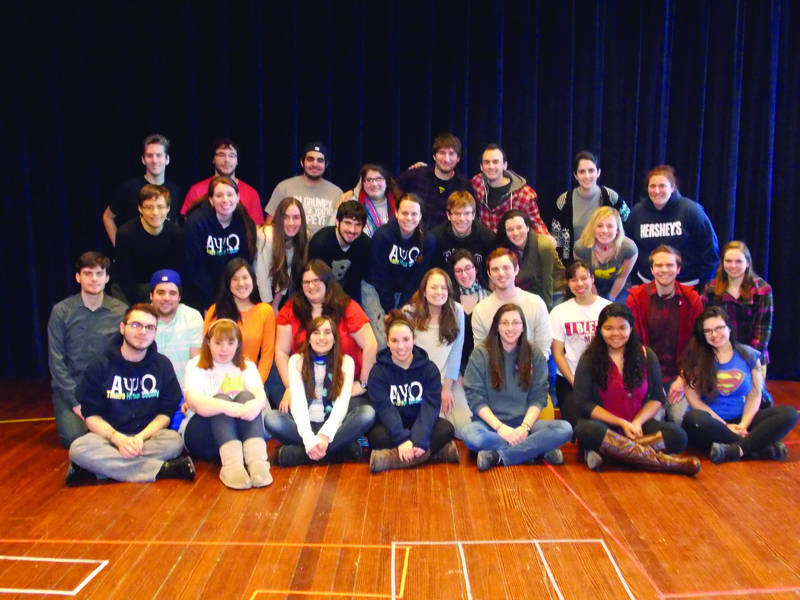 Alpha Psi Omega is Ramapo’s Theatre Honors Society. If you are a theatre major or simply have a love for entertaining or being behind the scenes then this is the organization for you! AYO strives to act as a catalyst for students to “get their feet wet” in whatever aspect of theater production they choose. From acting and directing, to designing and technical theater, we offer a safe environment for passionate students to learn and grow. We encourage student collaboration and mentorship in order to help facilitate a stimulating, goal-oriented atmosphere for student to thrive in their selected theatrical craft. We sponsor a plethora of events including 24 hour playfests, Café Adlers, Workshops, Staged Readings, our own full-fledged student production and also coordinate Ramapo’s very own Improv Troupe, The Fooligans. Join Alpha Psi Omega to immerse yourself in a fun and energetic theatrical world. Alpha Lambda Delta is an honor society that recognizes first-time first semester undergraduate students who have earned a 3.5 or higher cumulative GPA as part of the top 20% of their class. Alpha Lambda Delta’s mission is to “encourage superior academic achievement…to promote intelligent living and a continued high standard of learning, and to assist students in recognizing and developing meaningful goals for their unique roles in society. Alpha Sigma Lambda’s aim is to recognize the special achievements of adults who accomplish academic excellence while facing competing interests of home and work. Beta Alpha Psi is the premier international honor society and service organization for accounting, finance, and information systems students and professionals. There are over 300 chapters on college and university campuses with over 300,000 members initiated since Beta Alpha Psi’s formation in 1919. The purpose of Beta Alpha Psi is to recognize outstanding academic achievements, to provide opportunities for self-development and association among members and practicing financial professionals, and to foster lifelong ethical, social, and public responsibilities. Chapters are required to provide service to their campus, community, and profession. *A petitioning chapter must generally complete three semesters of successfully reported activities to be installed as a BAP Chapter. Beta Beta Beta (TriBeta) is a society for students, particularly undergraduates, dedicated to improving the understanding and appreciation of biological study and extending boundaries of human knowledge through scientific research. Each year, Ramapo’s chapter welcomes into membership those students who show a strong interest in Biology and who meet the standards of academic achievement set by the national society and our local chapter. Beta Gamma Sigma is the leading international business administration honor society serving business programs accredited by AACSB International – The Association to Advance Collegiate Schools of Business. Membership in Beta Gamma Sigma is the highest recognition a business student anywhere in the world can receive in a business program accredited by AACSB International. Upon induction, students pledge their commitment to “honor, wisdom and earnestness”. At Ramapo College and long afterward, membership provides access to networking and career-building events. Chi Alpha Epsilon was formed to recognize the academic achievements of students admitted to colleges and universities through non-traditional criteria and serves developmental, Student Support Services, McNair Scholars, and Educational Opportunity Program students. Its purposes are to promote continued high academic standards, to foster increased communication among its members, and to honor academic excellence achieved by those students. Membership to Chi Alpha Epsilon is offered to eligible students who hold a 3.0 cumulative G.P.A. for two consecutive full-time semesters and who were admitted to the college/university by way of the aforementioned type programs. Chi Alpha Sigma honors those student-athletes who have earned a varsity letter while maintaining a 3.4 or better GPA by their junior and senior years. Chi Alpha Sigma recognizes and honors high academic scholarship of college athletes at four-year accredited colleges and universities as well as recognizes the outstanding academic achievement intercollegiate varsity student-athletes. It also serves to foster and encourage good citizenship, moral character, and friendship among the high academic achievers in college athletics, while acknowledging student athletes who mentor and provide leadership to other athletes. Chi Alpha Sigma recognizes and honors the individual athlete, their team, sport, athletic department, and college or university. Golden Key is the world’s premier collegiate honor society. Golden Key is the first global honor society, now with over 400 chapters in 9 countries. In the U.S., we have nearly 300 chapters and established networks with national, regional, and campus presences. We recognize academic excellence and provide tangible value to our student members, advisors, recent alumni, and partners while positively impacting their lives and society. Kappa Delta Pi (KDP) is the only honor society that represents all educators—regardless of subject area specialty, degree obtained, grade-level focus, or years of teaching experience. Though diverse, all KDP members share a common purpose: A dynamic community of exceptional educators committed to promoting excellence in the education profession by recognizing and advancing scholarship, leadership, and service. Lambda Pi Eta (LPH) is the National Communication Association’s official honor society at four-year colleges and universities. As an accredited member of the Association of College Honor Societies (ACHS), Lambda Pi Eta has active chapters at four-year colleges and universities worldwide. LPH represents what Aristotle described in The Rhetoric as three ingredients of persuasion: logos (Lambda), meaning logic; pathos (Pi), relating to emotion; and ethos (Eta), defined as character credibility and ethics. Lambda Pi Eta recognizes, fosters, and rewards outstanding scholastic achievement while stimulating interest in the communication discipline. The National Society of Collegiate Scholars chapter at Ramapo College of New Jersey is an honor society that recognizes and elevates high-achieving students. Students are invited to join when they meet the criteria of having earned a GPA of 3.4 or higher in their first or second year of college. Students who join meet people on campus and at other schools they might not have otherwise – people who then become friends, long-term supporters, and future colleagues. The organization is proud to offer nearly one million dollars annually in scholarships, but more than that, NSCS is a growth opportunity, leadership training ground, and resource. As for our chapter here at Ramapo, we are proud to cosponsor events with other organizations and honor societies committed to scholarship, leadership, and service. Omicron Delta Epsilon is an international economics honor society that provides special recognition for outstanding economics students. The objectives of Omicron Delta Epsilon are recognition of scholastic attainment and the honoring of outstanding achievements in economics; the establishment of closer ties between students and faculty in economics within colleges and universities, and among colleges and universities; the publication of its official journal, The American Economist, and sponsoring of panels at professional meetings. Omicron Delta Kappa is a national leadership honor society for college students, faculty, staff, and alumni. It is based on the idea that leaders of exceptional quality and versatility in the college community should cooperate in worthwhile endeavors, and that outstanding students, faculty, staff, and alumni should meet on the basis of mutual interest, understanding, and helpfulness. This honor society gives recognition to meritorious leadership and service in extracurricular activities, promotes outstanding scholarship, and encourages the development of general campus citizenship. Order of Omega recognizes outstanding students who have attained a high standard of leadership in fraternal organization activities and encourages them to continue developing their potential and inspiring others to strive for similar excellence. Criteria for membership in The Order include character, scholarship, service, and leadership in fraternal affairs of Ramapo College. Additionally, The Order brings together members of the faculty, administration, alumni and Ramapo’s fraternities and sororities on the basis of mutual interest, understanding, and helpfulness. Phi Alpha Theta is an international history honor society open to students who have completed 16 or more credit hours of HIST courses at Ramapo College (not transferred in), with a 3.5 or higher HISTORY GPA (or by exceptional nomination) and a 3.0 or higher OVERALL GPA. Phi Beta Delta is the nation’s first honor society dedicated to recognizing individuals who have demonstrated scholarly achievement in the areas of international education and exchange. By increasing the recognition, credibility and importance of the international experience and by developing a campus network of students and faculty involved in international endeavors, the society creates a catalyst on campus for international programming. In addition, through the national organization, Phi Beta Delta connects individuals on campus and throughout the U.S. involved in the international experience by recognizing the importance of these achievements in higher education. Phi Lambda Upsilon was founded in 1899 as a national honor society dedicated to the promotion of high scholarship and original investigation in all branches of pure and applied chemistry. Student members are elected annually on the basis of their exceptional academic achievement and promise in the field of chemistry. Pi Mu Epsilon (PME) is the national mathematics honor society. Founded on May 25, 1914 at Syracuse University, PME currently has over 300 chapters at colleges and universities throughout the United States. The purpose of the Society is to promote scholarly activity in mathematics among students in academic institutions. Pi Sigma Alpha is the national political science honor society. The criteria for membership are at least 15 credits in political science courses (at least one of them at the 300 level), a 3.5 grade point average in political science, a 3.2 overall grade point average, and at least 64 credits total completed in college. The student does not need to have declared a Political Science major or minor to qualify. Psi Chi is the International Honor Society in Psychology, founded in 1929 for the purposes of encouraging, stimulating, and maintaining excellence in scholarship, and advancing the science of psychology. Membership is open to graduate and undergraduate men and women who are making the study of psychology one of their major interests, and who meet the minimum qualifications. Rho Alpha Sigma Zeta Chapter is the Residence Life Honors Society at Ramapo College. We are comprised of the top 10% of the most stellar RAs/SARDs and therefore have a commitment to community service and community appreciation. We assist the Residence Life Student Staff with their programs as well as run our own events on campus for both the resident and RA communities. We are committed to motivating and appreciating all within the Residence Life family and are focused on building on a proud tradition of excellence. Sigma Delta Pi, established on November 14, 1919, is a national collegiate Hispanic honor society. The Society’s purposes are, to honor those who attain excellence in the study of the Spanish language and in the study of the literature and culture of the Spanish-speaking peoples, honor those who have made the Hispanic contributions to modern culture better known in the English-speaking world, encourage college and university students to acquire a greater interest in and a deeper understanding of Hispanic culture, foster friendly relations and mutual respect between the nations of Hispanic speech and those of English speech, and to serve its membership in ways which will contribute to the attainment of the goals and ideals of the society. Sigma Iota Rho is an honor society devoted to promoting and rewarding achievements in scholarship and service in international studies. Students who are majoring in International Studies and other students with at least twenty credits that count towards the International Studies major may apply. Sigma Pi Sigma is the official honor society of the physics profession. It recognizes outstanding achievements in scholarship of physics and encourages interest in physics and science literacy. Sigma Theta Tau International is the honor society of nursing and recognizes students with outstanding achievements in nursing. The mission of the organization is to support the learning and professional development of nurses worldwide. The purposes of Sigma Tau Delta are literary, educational, and charitable. It strives to confer distinction for high achievement in the English language and literature in undergraduate, graduate, and professional studies; provide, through its local chapters, cultural stimulation on college campuses and promote interest in literature and the English language in the surrounding communities; foster the discipline of English in all its aspects, including creative and critical writing; promote good citizenship among its members, and exhibit high standards of academic excellence. Sigma Xi is a scientific research honor society dedicated to the encouragement of research in pure and applied science. Election to the society provides recognition of achievements in research and/or promise of future research accomplishments.